"This was in the early 1880's. Other islanders remember hearing that church leaders also wanted to replace the older hymn books (which included only the words to songs, not notes) with newer hymnals that included notes. Some members were attracted to singing classes and musical notes while others were not." "A singing teacher visited the island and wanted to teach the church members how to sing from books. One brother (a Howard) said this was all foolishness; that the singing was good enough when they h'isted the turne and he didn't see any reason for making a change and investing money in song books. But another brother (also a Howard) was equally vigorous in the contention that the singing would be greatly improved through the use of song books. 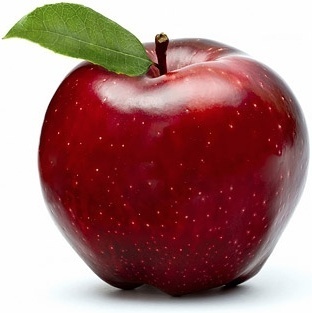 "Each of the two Howards had his followers and the dissension became quite bitter. Some of the members dropped out and started a new church. 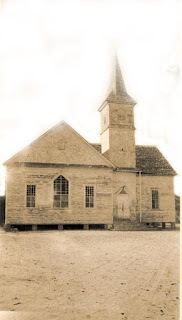 "From what I've been able to find out, the new church was known as the Methodist south Church. The old one was known as the Methodist Episcopal Church [Actually, the Methodist Episcopal Church, South, was the existing church at the time of the dispute; the new church was the re-introduced Methodist Episcopal Church. The national body had split in the 1840s over slavery). 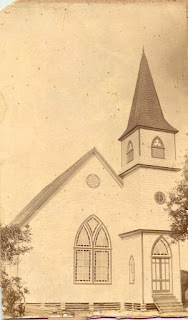 It had not been called the Northern Church because of any Yankee affiliation or sympathy but because it was north (in direction) from the other church. "The two Howard brothers whom I've mentioned were [Perry] Coleman and [Enoch] Ellis Howard, but there seems to be some disagreement about which one did which." [Coleman Howard was definitely a pillar of the Southern Methodist Church]. 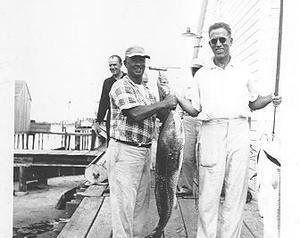 Thurston Gaskill was born on Ocracoke Island in 1902. He was a popular and well-respected hunting and fishing guide. He died in 2000. On June 30, 1978 The Washington Post published an article by Angus Phillips. 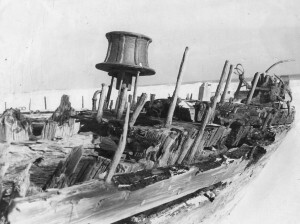 It was titled "Ocracoke Is an Island Unto Itself "
"I worked a couple of months on a dredge boat in Delaware Bay when I was 18," said Gaskill. "I got to see a little of how the city folks lived and then I turned around and sniffed my way back home like a dog. Been here ever since. It hasn't changed much." Visitors to the Ocracoke Preservation Museum may notice a millstone displayed in the front yard. From the first half of the 18th century until the early 20th century more than 150 windmills dotted the coast of North Carolina. At least sixty-five mills were located in Carteret County, twenty-one in Dare County, and twenty-four in Hyde County. Four, perhaps more, were situated on Ocracoke Island. Ocracoke’s windmills, like other mills on the Outer Banks, were post mills. These mills, of German design, were developed in Europe in the twelfth century, and the designs were brought to America by the British as early as 1621. 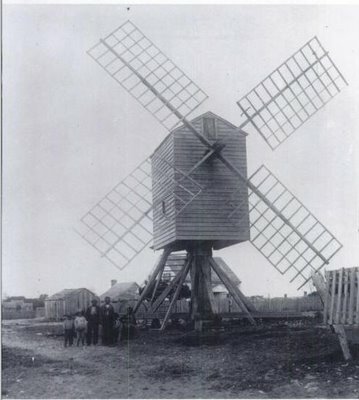 Post mills consisted of a wooden house (the main body of the structure) that was mounted upon a 10’ – 12’ vertical post supported by diagonal braces. The typical house was about 10’ square, and 12 or more feet tall with a gable or gambrel roof. Four external rectangular frames were affixed to a large cross attached to a horizontal axle protruding from the upper section of the house. These frames were covered with canvas sails that could be reefed to adjust the speed of revolution for varying wind velocities. The entire structure could be rotated around the vertical post in order to harness changing winds by means of a 25’ – 30’ tail pole that was attached to the house. On the far end was a wheel that rested on the ground or on a circular metal or wooden track. By simply pushing the tail pole the windmill could be rotated to face wind coming from any direction. A removable ladder provided access to the inner workings of the mill, a series of wooden wheels and cogs connected to the wind vanes that turned the grinding stones. Most Outer Banks windmills were put out of service during the Great Hurricane of 1899. They were never rebuilt. If you hang around the docks at Ocracoke long enough you will occasionally hear an islander mention pogie boats. You might wonder what he is talking about. Poghaden (derived from the North American Indian word pauhaugen) is a synonym for menhaden, small oily fish that swim in large, tightly packed schools. These fish are harvested by trawlers, often called "pogie boats," for use as fertilizer. Menhaden fish, which are high in omega-3 fat, are also a major source of fish oil and fish meal (for food and dietary supplements as well as animal feed and even lipstick). In September, 1944, the wife of one of the men stationed at the Ocracoke Naval Base wrote a letter to her family describing the effects of the 1944 Hurricane on the island. She writes, "About 6:30 the electricity went off .... The winds had torn the wires down. The tide started increasing rapidly at 6:30. We could see Silver Lake swell, run over and by 8 o’clock it was rushing all around the house and coming in under the doors." The writer describes the storm and the aftermath, including the exhausting cleanup. Early in the letter she shares this thought: "I’m just thankful I’m alive." You can read letter here: https://www.villagecraftsmen.com/news102117.htm. 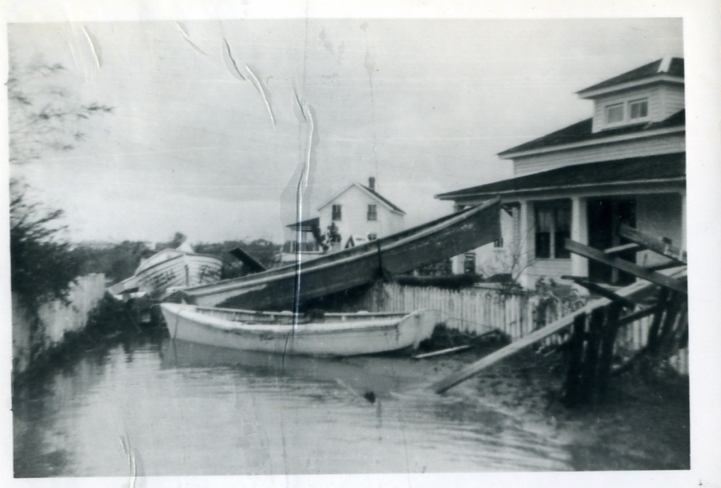 Our current Ocracoke Newsletter is a transcription of the handwritten letter, with vintage photographs added. You can read it here: www.villagecraftsmen.com/news102117.htm. 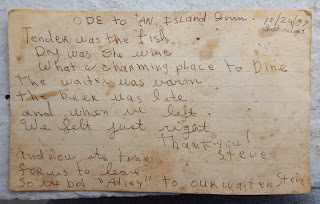 In 2010 I wrote about the Doxsee Clam Factory on Ocracoke Island. 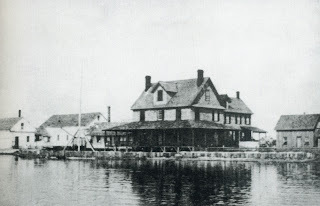 The Doxsee Clamming operation was originally established on Long Island's south shore, in the hamlet of Islip, New York, on the east side of Orowoc Creek off of Maple Avenue. A New York newspaper article published in 1901 notes that "Of late, owing to the inabi1ity to get clams, a much smaller force has been employed and while the removal of the plant [to Ocracoke Island] is greatly regretted, the loss is not so keenly felt as it would have been some years ago." For more information about James Henry Doxsee and Islip New York click on this link to the Islip Historical Society: http://www.isliphamlethistory.org/historic_markers.html?select=%22doxsee_clams.html%22. On Ocracoke the Doxsees built their new clam processing plant close to Pamlico Sound, on the southern shore of the “ditch” (the entrance to Cockle Creek). It was, by island standards, a large operation. Local fishermen harvested clams, which they brought to the Doxsee’s dock. From there the clams were carried to a nearby building and steamed. The steamed clams were then taken to a long shed building and dumped onto wooden tables. Most of the island’s young, unmarried women, as well as several widows, worked at Doxsee’s picking clams. Empty shells were simply tossed out of the windows. 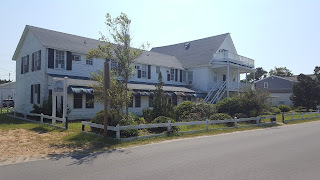 Click here for more information about the Doxsee Factory on Ocracoke: http://www.villagecraftsmen.com/news112110.htm. In 2009 I published as one of our monthly newsletters "A LETTER CONCERNING A VISIT TO OCRACOKE" By C.A. Weslager. The letter was written July 31, 1949 from Wilmington, Delaware. "The island is covered with heavy sand and only jeeps can navigate. 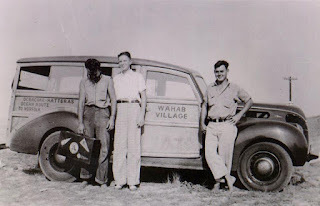 Several natives have them and provide taxi service to visitors. We hired one driver to take us to Hatteras Inlet at the north point of the island. We went when the tide was right so that we could sweep up the beach as each wave washed in and out. The idea is to get the jeep wheels on the sand that the water has just laved — otherwise one either sinks, or slides, and the minute that happens a wave rolls over you and the jeep is carried away. It was a thrilling and dangerous ride. One must also travel fast in order to keep from sinking in the sand. There were four of us and the driver, and he was the only one who didn't seem frightened." Any death in a small community affects many people. Recently two well-known and respected native islanders died. Last week Thomas Midgett, a Vietnam veteran who retired from the NC Ferry Division and later worked for the National Park Service, died at his home on Ocracoke. 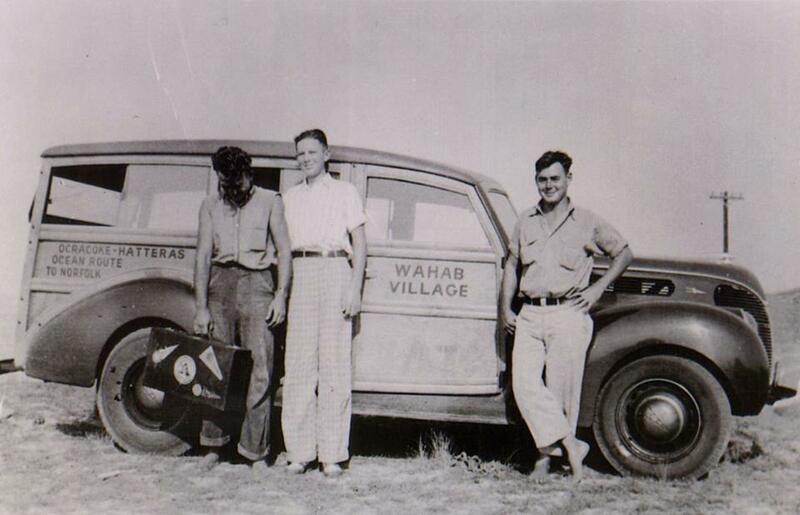 Thomas was friendly and well liked by native islanders, newcomers, and visitors alike. He was known as one of the island's foremost gardeners. Thomas was 67 years old. You can read his obituary here. On October 7 Jule Garrish, 94, died at his home in Beaufort, NC, where he lived with his wife Rosemary. Jule's first wife, Etta Mae Howard, died a number of years ago. Jule was a US Navy veteran and was retired from the US Coast Guard and the NC Department of Transportation. Many of our readers will remember Jule as a featured performer at the Ocracoke Opry in Deepwater Theater. His signature song was "Governor Edward Hyde," a tribute to the Swan Quarter ferry. Audiences loved it when Jule paused to speak into the soundhole of his guitar. "This is your captain speaking...."
You can read Jule's obituary here. Jule is buried in the Howard graveyard across the lane from Village Craftsmen. According to Wikipedia: "[John Viele, retired U. S. Navy officer] points out that mariners interpret a light as indicating land, and so avoid them if they cannot identify them. Moreover, oil lanterns cannot be seen very far over water at night, unless they are large, fitted with mirrors or lenses, and mounted at a great height (i.e., in a lighthouse). In hundreds of admiralty court cases heard in Key West, Florida, no captain of a wrecked ship ever charged that he had been led astray by a false light." Nevertheless, in 1825 Congress approved an act stipulating that "if any person or persons shall hold out or show a false light or lights, or extinguish any true light, with intention to bring any ship or vessel, boat or raft, being or sailing upon the sea, into danger or distress, or shipwreck, every person so offending, his or her counsellors, aiders, and abettors, shall be deemed guilty of felony, and shall, on conviction thereof, be punished by fine not exceeding five thousand dollars, and imprisonment and confinement to hard labor not exceeding ten years, according to the aggravation of the offense." Perhaps there is some truth to the legend! In 1939 W. O. Saunders from Elizabeth City, N. C., interviewed Ocracoke native Isaac (Big Ike) O"Neal (1865-1954). Big Ike was 74 years old at the time of the interview, which was conducted in his home on the island. Saunders describes Big Ike as "A mighty man he has been in his day, measuring six feet two in his stocking feet and tipping the scales at 240 pounds. At the age of 74 he is still a robust enough man, to all outward appearances, and his speech is punctuated with an infectious laugh and a flashing of good white teeth." "Life was hard when I was a boy. There wasn't but one other family on this island that had a harder life than ours. My father fell through the hatch of a ship when I was a little boy and was crippled for life. He couldn't do any hard work after that. "But we always had somethin' to eat; fish and clams and oysters and crabs. Never had much flour bread; if we had flour bread once a week we did mighty well. Corn bread was our bread. "We had two wind mills on the island that ground corn. When there was no wind the mills didn't turn. I remember we once had a calm for twenty one days. But most families had their hand stones to fall back on at such times. It took a half hour to grind enough corn for breakfast with those old hand stones. "No, we didn't grow corn on the island; we got our corn from the mainland; took salt fish, oysters and clams to the mainland and traded for corn and molasses. "We didn't know what white sugar was; and never saw much of the brown sugar that was used in those days. Coffee? The only coffee we had was parched chestnuts which we boiled and made what we called coffee. Sweetened it with molasses. Most often we drank yaupon tea; just step out your back door and gather your tea leaves. Yaupon still grows wild on the island, but most folks now-a-days hold themselves above drinkin' tea made out of it." Look for more excerpts from this interview in future posts. 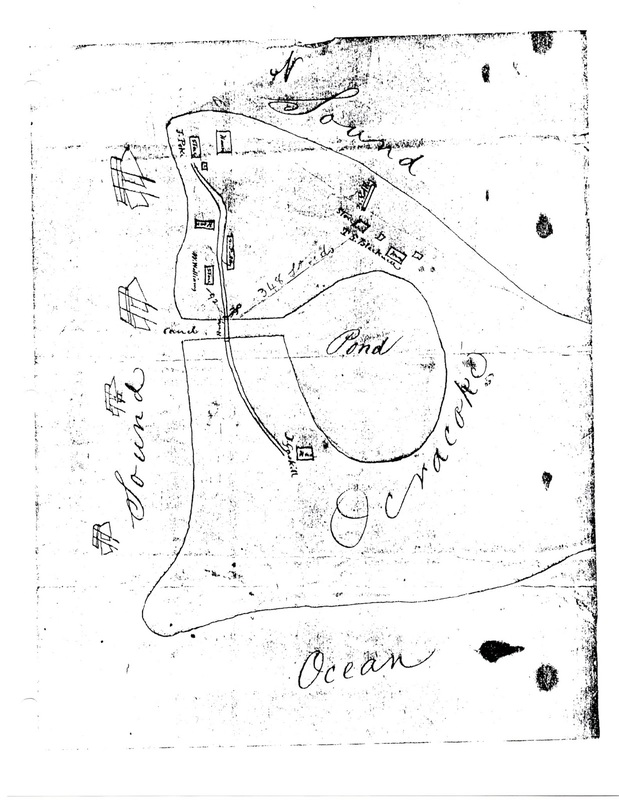 At one time there were three "ponds" in Ocracoke village. The largest, Silver Lake, is not a lake, and neither is it a pond, although some early maps list it simply as the "Pond." It is actually a wide, naturally shallow tidal creek. Old time islanders still call it by one of its early names, Cockle Creek. Northern Pond is not a pond either. It is a cove located just north of the village. This Google image shows it clearly. Finally, there is Mary Ann's Pond...or more accurately, there was Mary Ann's Pond. 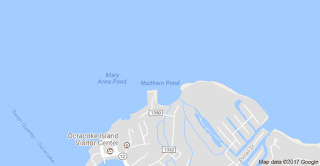 It was located just west of Northern Pond (and is still listed on the Google Map above), but Mary Ann's Pond is gone. It was filled in by the Navy during WWII. This "pond" was named after Mary Ann Styron (born ca. 1795) who lived on the shore of the pond with her husband Francis Williams. You can read more about Mary Ann's Pond here: https://ocracokeobserver.com/2016/08/31/where-did-mary-anns-pond-go/. 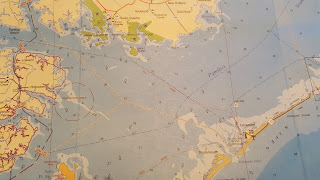 Last week a reader commented on our post about the spuds visible near the Cedar Island/Swan Quarter ferry channel, and asked if the spuds could be located on the map I reproduced on our post about Ocracoke Inlet. 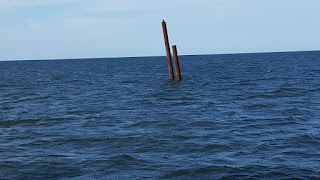 Five years ago I published a post about these metal "piles" that the Swan Quarter and Cedar Island ferries pass as they enter Big Foot Slough Channel, just a few miles northwest of the village. In case you missed that post, these piles are called spuds. They are part of a sunken dredge (the Lehigh) which sank in 1942. Spuds are used to pinion a dredge to the bottom while working. Native islander Benjamin Early Spencer was captain of the Lehigh, and a couple of other Ocracokers were working on the dredge along with about nine other men. The Lehigh was approaching Ocracoke to dredge the harbor in preparation for bringing vessels to the docks at the WWII naval base. The Navy's mission was to thwart German U-boat activity off shore. Strong winds produced huge waves that swamped the dredge, and she quickly sank. Navy personnel at the newly established base rescued the captain and crew. The Island Inn, one of Ocracoke Island's iconic hotels, is for sale. Built in 1901 as a school house and Odd Fellows Lodge, it was later used as a residence, a WWII officers quarters, a coffee shop, and, most recently, a hotel. The southwest wing was added immediately after the war; the northeast wing, in the 1950s. For many years the Inn included a popular restaurant. Unfortunately, the building has not been well maintained, and is presently in a state of disrepair, and in need of renovation. A number of concerned island individuals and preservation organizations would like to see the Inn (or at least the historic central section) restored, but the money necessary is not available. The future of the Inn is unclear. A few weeks ago I had the opportunity to listen to Chester Lynn share stories about the Island Inn. In the 1980s Chester was manager of the restaurant. He showed me this note left by one of his patrons. It is stained and yellowed, but Chester has kept it all these years. 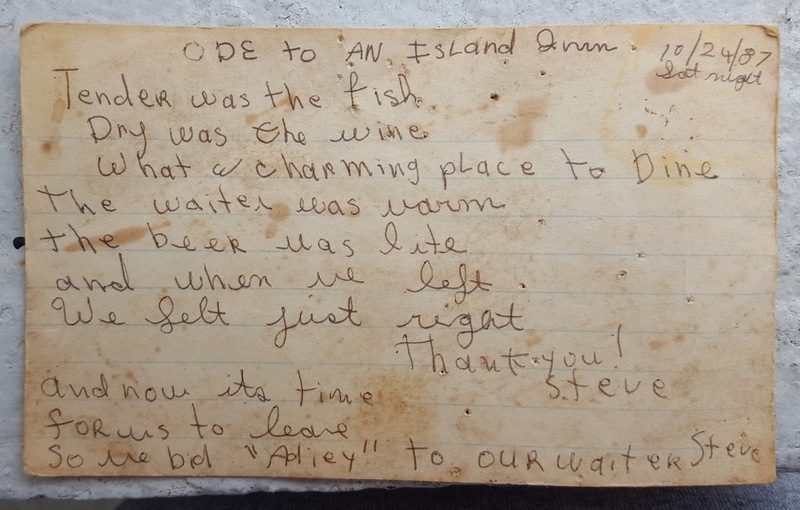 ODE to AN Island Inn. 10/24/87, Sat night. "One summer the passenger seat on my old jeep finally collapsed. It was rusted, broken, and had to be taken to the dump. People had been teasing me for awhile about taking folks for rides, saying they all needed a massage afterwards. Since I'm a bodyworker, among other professions, this sure looked like a sneaky way to get business! But this is a story about synchronicity and recycling. 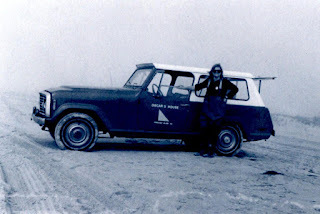 "An old friend of mine, an engineer, was visiting the island and saw my jeep with no passenger seat at Oscar's House. 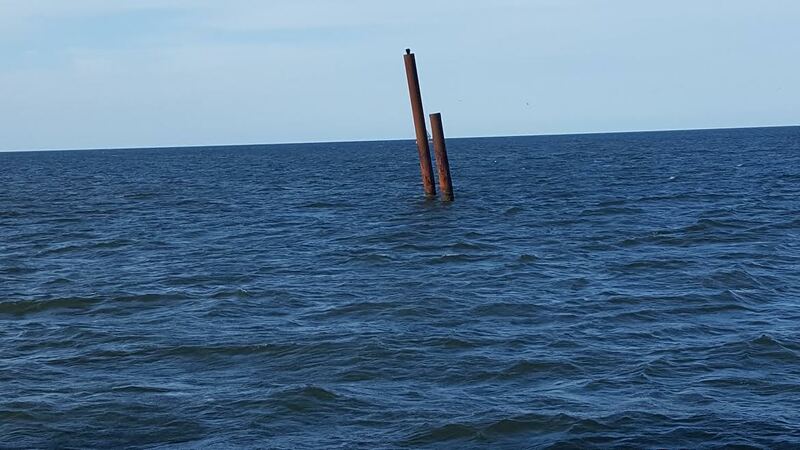 "Later when he and his son were kayaking in Pamlico sound, my friend Phill spotted a floating Adirondack chair, at least part of one. To him it looked like just the part my jeep needed. His son was confused. He couldn't really see how the broken chair part would work, plus he thought the old jeep was already strange. He called me 'lady with the car with no doors.' At dad's insistence, they lashed the chair part to their kayak and paddled it to shore. "I loved the wonder on the son's face when dad inserted the old chair part into the jeep's empty front seat. Wow! Perfect fit! He really couldn't believe my delight, but of course he hasn't lived for decades on a small barrier island with only a few stores. The salvaging of a working part, and that becoming the surprise solution to my jeep's seating, were cause for great celebration! With a wave and a bit of lingering confusion, the boy and his dad rode off on their bikes. An unusual job well done!" Click here to read more about Ann's Bed and Breakfast, Oscar's House. 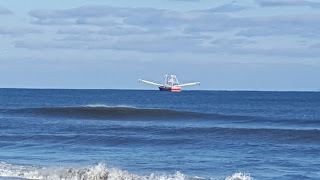 A few days ago a reader left this comment and question on our blog: "[I]t seems pretty amazing that Ocracoke Inlet has been opened as far back as we can record... Inlets act more like what you describe for Hatteras inlet; moving, opening, closing, shifting. I wonder if there's a theory about why OI inlet has stayed open as far back as records are kept...?" The following should help explain why Ocracoke Inlet is unique...from THE NORTH CAROLINA OUTER BANKS BARRIER ISLANDS: A FIELD TRIP GUIDE TO THE GEOLOGY, GEOMORPHOLOGY, AND PROCESSES (http://core.ecu.edu/geology/mallinsond/IGCP_NC_Field_Trip_Guide_rev1.pdf). "Oracoke Island is situated on an interstream divide between Pamlico Creek (the riverine system occurring beneath Pamlico Sound during the Last Glacial Maximum) and offshore paleo-watersheds. The Pamlico Creek valley extends beneath Ocracoke Inlet (Fig. 6b*), making this inlet the most stable and long-lived in the Outer Banks system. Ocracoke Inlet is the only inlet that has remained open throughout historic times (i.e., since 1590 – the first map of the Outer Banks)." 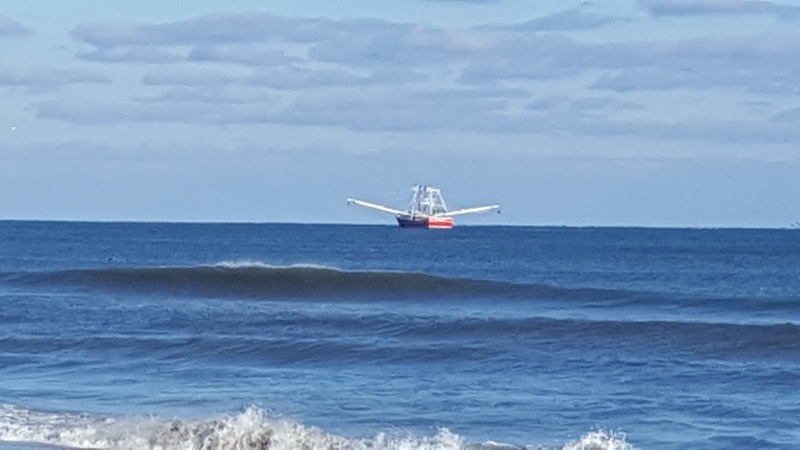 Today outflow from the mouth of the Pamlico River (not to be confused with Pamlico Creek, a paleo-creek referenced above) continues to help keep Ocracoke Inlet open. Below is a detail from The 2011-2012 Coastal Boating Guide published by the North Carolina Wildlife Resources Commission. You can see the mouth of the Pamlico River in the upper left corner of the map. About 25 miles to the southeast is Ocracoke Inlet. 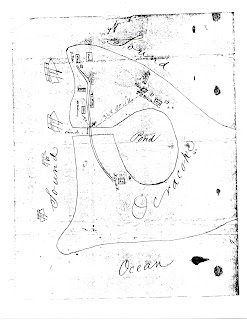 In March of 1801 Ocracock (Ocracoke) Inlet and Beacon Island (a small island between Ocracoke and Portsmouth Island) came to the attention of President Thomas Jefferson. In a letter to the newly elected President, Richard Dobbs Spaight (1758–1802) of New Bern (he was a member of the Continental Congress from 1783 to 1785, a delegate to the federal Constitutional Convention in 1787, governor of North Carolina from 1792 to 1795, and interim congressman until March 3, 1801), advocated for the completion of a fort on Beacon Island. 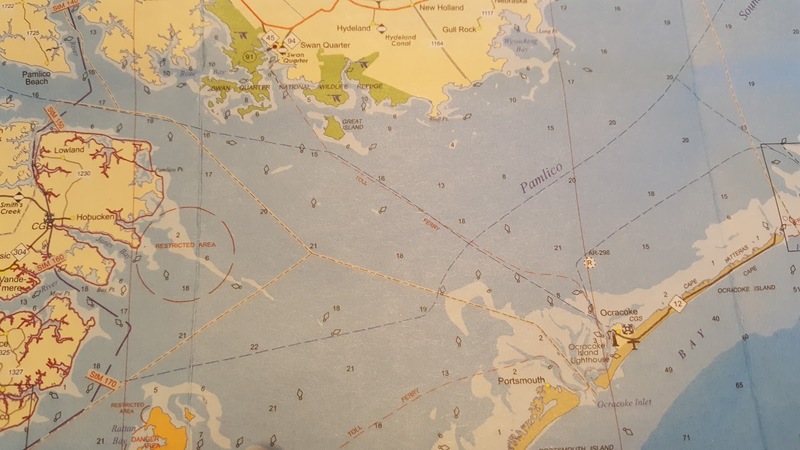 He informs the President that "there is no place on earth where smuggling can be carried on with more advantage, & with less probability of Detection" than through Ocracoke Inlet. 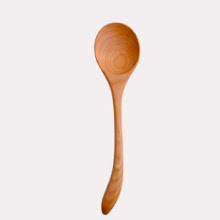 Spaight reminds Jefferson that "All the trade of No. Carolina except what is carried on at Wilmington, and a little at Beaufort & Swannsborough, passes over Ocracock bar: and the fort at Beacon Island command both Harbours, or, roads, where the shipping bound either in, or out come too in order to lighten, to enable them to pass the swash. It likewise commands both the passages that lead from the harbours or roads, up into the Country."